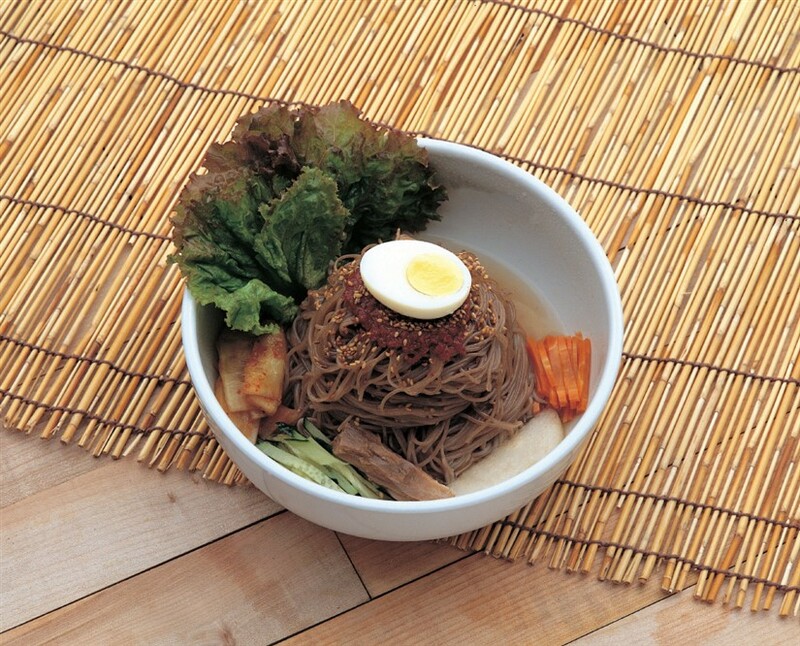 Naeng myun is traditional Korean noodles usually made of buckwheat. Bibim naeng myun is a dish made with naeng myun and served a spicy sauce that is usually made with gochujang. It is a summer dish as Koreans believe in fighting heat with heat, but it can be eaten all year round. The sauce is made with onions, gochujang, vinegar, sugar, sesame seeds, gochujaru, garlic, salt, beef broth/water, sesame seed oil. Soy sauce can also be added. Lastly, the buckwheat noodles (bibim) are boiled according to package directions. After boiling, the noodles is given an ice-cold bath and then drained. The noodles is served with the sauce and topped with boiled eggs, pears, cucumbers, kimchi and any other desired ingredients. Vinegar and sesame seed oil can be added to taste. If you want to eat bibim naeng myun without the stress of making it from the scratch, instant noodles and packaged soup broth can usually be found in Korean grocery sauce.